Micah Weese is exceptional as Scrooge. Weese is at first booming and commanding, then becoming softer and more transparent in his emotions. Weese makes a drastic turn as Scrooge sees the error of his ways. The change the audience is waiting for is a delight to experience alongside him. Justin Armer as Scrooge’s faithful employee Bob Cratchit is the underdog you love to cheer for. Armer takes the abuse slung at him by his employer and still has grace and forgiveness in his heart, as well as love for his family and hope for his precious tiny Tim. Race Ricketts is a fright as Scrooge’s “dead as a doornail” business partner Jacob Marley. With chains around him and lightning at his command, Ricketts delivers some hard truths to Scrooge in his brief visitation. Madison Penzkover is pleasant as the Ghost of Christmas Past. The easiest of the spirits to receive, she’s light on her feet and delivers her message with kindness. Reagan Sudduth is the Ghost of Christmas Present, and his time on earth is fleeting. Sudduth enters the scene with a bang, as many of the scenes in this play do, and the chorus line that accompanies him is a symphony of holiday cheer. Sudduth also plays Fezziwig, Scrooge’s old boss and one of the happiest characters ever to grace the stage. Fezziwig embodies everything that Scrooge does not, and reminds him of who he could and used to be. Sudduth is boisterous and jovial, perfect for each role. Likewise, Alyssa Fantel as Mrs. Fezziwig absolutely steals the show! The scene featuring the Fezziwig Christmas party is terrific, with dynamite dance numbers and an energy uptick that perks up audience and cast members alike. 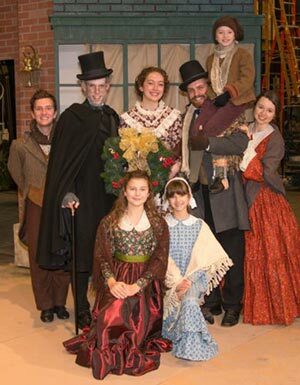 The cast of OU’s A Christmas Carol. Photo courtesy OU Fine Arts. The Ghost of Christmas Future is depicted by two puppeteers, Jaden Kelly and Chip Keebaugh, who wield a 12 foot tall Death-like apparition that floats ominously behind Scrooge. This is perhaps the scariest scene in an already jumpy production. The final spirit to visit Scrooge is accompanied by heavy rolling sound effects, and the favorited lightning and thunder that’s already been utilized several times. This may all prove too much for the littlest of children in the audience. 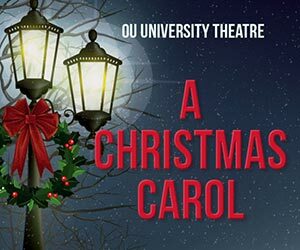 OU’s production is touted as family friendly, but it’s no child’s tale that is shown here. Several disruptively loud scenes cause little ones to cover their ears, and some moments are downright disturbing. The scene with Ignorance and Want is practically nightmare inducing. This play is quite a thriller. After all, it is based on the classic Charles Dickens novella, which was subtitled ‘A Ghost Story of Christmas’, and that it certainly is. The child actors bring an added sense of wonder to this Christmas fairytale, and the young pros onstage are lovely and versatile. Hanna Andreassen, Hannah Butler, Joshua Cheng, Alexis Jordan Dorris, high-schooler Madilyn Kellam, and Harper Orr all play multiple roles as well as the ensemble, and knock each scene out of the park. Fantastic dance numbers are performed by Joni Keaton, Kieran King, Cameron Terry and Claire Willcutt. Costume design by Lloyd Cracknell is authentic and bright. J. Clayton Winters is assistant director. If you wish to attend this show with your kids, keep in mind the somewhat scary elements. Children five and up should be okay, particularly if your child seems to think that ghosts are “awesome and cool”. That’s a direct quote from a certain five year old who attended with his mom, who happens to be writing this review. Most kids will do fine, although there are a few startling moments throughout. However, all ages are welcome. Just keep in mind any sensitivities and tolerance levels, especially when bringing the young ones.